Everton and Gor Mahia contested the SportPesa Trophy this evening, in an exhibition game that featured Yerry Mina and a slew of fringe first-team players for a rare mid-season friendly at Goodison Park. It was the second meeting between the two sides after last year's match in Tanzania where the Blues ran out 2-1 winners. Gor Mahia earned the right to play Everton when they retained the SportPesa Super Cup by beating Simba SC in June. While this was a dream trip for the Kenyan club, from Everton's perspective it provided an opportunity for Yerry Mina, in particular, to get some valuable game time ahead of Sunday's Premier League clash with Chelsea. The Colombian defender, who made his long-awaited home debut as a very late substitute against Brighton on Saturday, is almost certain to start for the first time at Stamford Bridge with Kurt Zouma ineligible to face his parent club. With the Under-21s in action against Barnsley in the Checkatrade Trophy, the rest of the team featured a number of first-team players who have not seen much action in recent weeks. 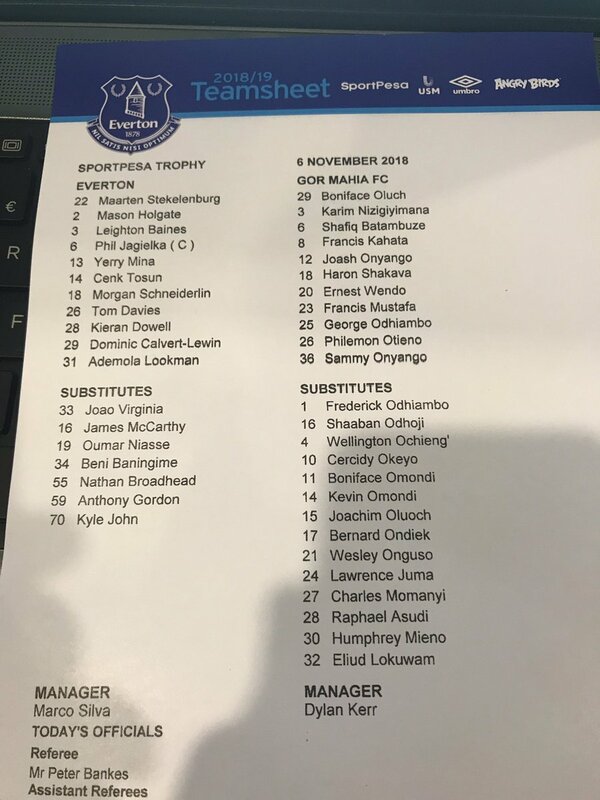 That meant a starting XI featuring Maarten Stekelenburg, Mason Holgate, Tom Davies, Morgan Schneiderlin and Phil Jagielka Leighton Baines was expected tos atrt but was withdrawn before the start, replaced by Beni Baningime, with Jonjoe Kenny apparently injured. The game kicked off in front of a decent enough crowd packed into the Park End and Family Enclosure, with a smattering of people in parts of the main stand... the Bullens Road and Gwladys Street stands eerily empty and echoey for such a 'historic' occasion. Fine opening goal from Lookman off a great cross from Tosun after 15 mins. A good break from a Gor Mahia corner saw Calvert-Lewin brought down but Dowell picked up the ball and fired home through the keeper from a narrow angle. The only change at the break was Joao Virginia replacing Marteen Stekelenburg in the Everton goal. More subs came on in the second half and one of them, Nathan Broadhead, bundled the ball over the line after his first strike was saved following a fine cross from McCarthy. Niasse finally got on the scoresheet with a crisp shot after fluffing a number of chances. Everton: Stekelenburg (46' Virginia), Holgate, Baningime, Jagielka (76' John), Mina, Davies, Schneiderlin, Lookman (86' Broadhead), Dowell (76' Gordon), Calvert-Lewin (62' Niasse). Tosun (62' McCarthy). Very handy that we have this friendly –- something I think we should do more often for our fringe players. I'd give Lookman and Bernard a start – Lookman on the left (where I'd start him against Chelsea) and Bernard on the right – to try get him into some form. Tuyisenge will likely come up against Colombian defender Yerry Mina, Everton's Sh6 billion acquisition from Barcelona in August following an impressive outing at the 2018 Fifa World Cup where he scored three goals. English forward Theo Walcott, Irishman Seamus Coleman, Sandro Ramirez and former Manchester United midfielder Morgan Schneiderlin are also expected to feature for Everton. Having consistently conquered the local and regional front in recent times, this will be yet another opportunity for Gor Mahia players to introduce themselves at the international stage. I think they're in for a shock when they see the real team sheet. I assume this game is not on TV / stream somewhere? I just hope Mina doesnt get injured! Knowing our track record well be going to Chelsea with a left back at centre half or something mad like that. Subs: The entire starting first XI, give them about 10 mins each, out of respect for the Gor Mahia fans. Ajay. It makes no sense whatsoever to play Stekelenburg in goal. We need to know what level Virginia is or will be. Stekelenburg only specializes in total let-downs. Ajay, that's a pretty decent team! Shows how much stronger our squad is this season. I'd give Dowell a start somewhere though. I really like this sort of thing, we should do it more often to gain fans around the world and give game time to the rest of the squad. It's a great chance to give people the opportunities they deserve and also give some youngsters a place on the bench. ● Lookman to start on the left (where I'd start him against Chelsea). This is by no means a bad team – with a full team of players fighting for a first-team starting spot. Subs: Virginia, Jagielka, Markelo, Baningime, McCarthy, Dowell, Niasse. What I like about this formation is that is what we often change to in the second half - so it gives us some preparation and practice for that situation. I would preferably give McCarthy, Dowell and Niasse game time. Jon, I believe the club are streaming it for members and season ticket holders. That was said during the streaming of the U21 game last week. SportPesa have said they'll be streaming through their Facebook page. I'd give Virginia a run out in goal over Stekelenburg and start McCarthy. What an absolute waste of time and effort this game is. If the sponsors are that keen for this game to happen, then do it at the end of the season. The game is totally meaningless, just hope nobody gets injured. I don't think it's a waste of time, Brian, we have more than 11 players on the fringe of the starting 11 for one reason or another; game time will do them the word of good! Absolutely pointless match; risking Yerry in a game like this is just tempting fate. I hope I'm wrong but I don't see the benefit of it considering we play Chelsea next — not exactly the perfect warm-up match for the big time, is it? I will be going to the game – easy for me, I only live 5 minutes by bus from the ground. The main reason I am going is to give the team from Africa some applause. It will be a big night for these young footballers, from another continent, playing at Goodison Park. I agree, the match should have been arranged for an afternoon game in the summer, then a bigger gate would have been more certain with a lot of parents bringing their kids to see this game. But what's done is done, I hope we get a decent crowd (4 or 5 thousand?) to give these lads from Africa a bit of a Scouse welcome. Who needs the Euro Super League when you can compete for the illustrious SportPesa Trophy? Lukaku should have stayed and got the chance to lift some silverware! Hopefully Marco will be realistic in who he plays. For me, that means not risking any player who would start against Chelsea. I saw an interview with Yakubu who said this team are 'physical', which is worrying regarding possible injuries. Apart from the possibility that Mina might perhaps get an hour, or maybe a half of the match, I wouldn't expect any of the players likely to play at the weekend to feature. I'd expect the recent starting XI plus Lookman to have the night off, probably watching from the stands. There are enough other players available to put out a decent team and bench. Dave @ 13, fantastic post. I am a Kenyan and proud fan of Gor Mahia. Kenya is sadly not known as a footballing powerhouse. Over the years, these shores have only produced Victor Wanyama, McDonald Mariga and Divock Origi's father as players of any note. It will be a huge game for us, being broadcast live here and our family is gathering to watch the game. Along the way, we will place a few bets via SportPesa. I fully understand the frustration of a few posters, questioning why the game was being played now – in fact, they may recall it was supposed to be in pre-season but EFC I believe dropped the fixture. The game was part of the sponsorship deal, so it does, if you like, have financial meaning behind it. More importantly, Everton is now on the way to becoming a big brand in East Africa, where SportPesa makes its millions, which it ploughs into overseas sponsorship to build its own brand. Along the way, by growing Everton's brand in East Africa with matches such as this, they will of couse see a huge commercial benefit. Everton will hopefully use the game to give a few rusty legs a run out, and at the same time post a good result which will continue to help their awareness in this neck of the woods. Total East Africa population: 120 million, so not a market to be sniffed at – it is bigger than places like Malaysia and Thailand. SportPesa is an East African brand, operating in all 3 countries, which now have a single market (called the EAC). Good post Amit. I think you're right in saying Everton pulled out of the pre-season with Gor. "These shores have only produced Victor Wanyama, McDonald Mariga and Divock Origi's father as players of any note." Very good! Thanks for that, Amit, you're very informative. And good luck to our guests this evening. COYB! I would give an hour to both Keane and Mina, Mina, as well as game time, needs time alongside his defensive partner. An hour for Lookman, no more as we may well need him, and an extra 30 mins for Bernard who is still fitting in. Game time for the fringe players, and 10 minutes to the 3 main stars of the team for sponsorship reasons. However, what constitutes a first team player could be open to interpretation and it seems likely that manager Marco Silva will turn to his fringe players with the game coming in between Premier League fixtures against Brighton & Hove Albion and Chelsea. Would like to see Virginia too, don't play Kenny as he's been injured anyway so no point. Take Lookman off at half-time so he's ready for Chelsea and give Calvert-Lewin or a youngster a run-out, rest the 1st XI and let them sign autographs for all travelling fans and kids at the ground. Huh... Not heard of the EAC, Amit. The East African Community (EAC) is the regional intergovernmental organization of the Republics of Burundi, Kenya, Rwanda, Uganda and the United Republic of Tanzania with its Headquarters in Arusha, Tanzania. This is the only match this side of the December glut of fixtures in which Silva can give an outing for the players who now find themselves out of the first team picture. From that point of view, the game will serve a useful purpose because we might well need to call upon them next month. I am not worried about Mina getting injured. The game will be played as a friendly so I very much doubt the tackles will be flying in. I would be more concerned if Mina made a full debut at Stamford Bridge without any meaningful chance to acclimatise. Well, if we have to play "first team players" there are plenty to choose from who are unlikely to be on the pitch at Stamford Bridge, other than as a substitute. Jagielka, Baines, Holgate, Schneiderlin, Calvert-Lewin, Kenny, Tosun, Davies, Lookman and Niasse have all made Premier League appearances this season; Dowell and Stekelenburg have both appeared in the League Cup. Lyndon, or Michael, will there be a Live Forum tonight? For those who can't get the game, or have no access to any streams, or are unable to go to the game, it's the next best thing to keep up to date with the match. Live Forum? Yep: Link added. Thanks, Michael, I can't see any mention of streaming to We Are Everton Members or Season Ticket holders, does anyone have any better information? I hope you really enjoy tonight's game then, Amit, and it also gains Everton loads of “fans from East Africa”! Pickford, Kenny, Mina, Keane, Baines, Gueye, Gomes, Davies, Bernard, Richarlison, Lookman. Then subs from Virginia, Holgate, Baningime, Calvert-Lewin, Tosun, Walcott, Sigurdsson, Dowell. Make it more of an occasion to create ‘loads of East African fans' — Tony (#33), I like that. Let's also make it meaningful for the Gor Mahia players as well as filling the sponsorship coffers. Tonight's game against @OfficialGMFC will be streamed live on our YouTube channel for fans outside of the UK - and Africa, where separate broadcast agreements are in place. I spent 3 weeks in Tanzania this summer, just south of Kenya and home to around 55 million of the EAC's population, and I'm not convinced this will bring us either lots of fans or considerable revenue down there. They are intensely passionate about football down there, especially the Premier League. Bizarrely The local buses and taxis are decorated top to bottom with emblems, team names, pictures and names of players plastered all over them (I took the Sir Alex Ferguson bus to town twice in Arusha). Even in the remotest areas, you are guaranteed to see people wearing Premier League strips from across the ages. However, sadly these are almost solely the shirts of the predictable global juggernauts. I only spotted 2 Everton badges, and one of the fellas had no idea of its significance when I struck up a conversation with him. I know it's not an exact science but I even spotted twice as many shirts of both Leicester and Aston Villa. Football being the international language, I spoke to plenty of locals on my travels and tried to gauge how well-known the Blues were. The game in Dar es Salaam last pre-season definitely didn't go unnoticed, but the only player anyone could name to me was Wayne Rooney! And, without exception, everyone I spoke to was a Man Utd, Chelsea, Arsenal or RS fan. Sadly, we seem to have missed the boat in securing a global fanbase, and the only way to catch up is by breaking into the elite... Evidenced by the more modest, but clearly growing, number of Man City fans I encountered on my way. Total waste of everyone's time. Just hope nobody get's injured. It will be interesting to see how big small the crowd will be tonight. When I looked on the ticket section of the OS, and the incredibly cheap ticket prices, it seemed that only two or three sections of Goodison Park would be open – would be a testament to the lack of faith the club has in the fans they know only too well are unlikely to show for this. A pity in some ways, but I'm more with those who see this as a meaningless sponsored 'promotion' that is unlikely to impact the dismal state of play Dave Harrison (#36) describes in the EAC. Sounds as if one member of the senior management team will be at Wembley, rather than Goodison, tonight. Marcel Brands will be watching his old team PSV according to this report in the Echo. Well worth a read as it gives valuable insight into how Brands operates. If he can replicate what he set up at PSV with us, expect him to uncover some real rough diamonds to be polished. I'd start McCarthy, rest Gueye and play Mina beside Keane, to give them time together before the Chelsea game. Great occasion and sends a great message out there … to East Africa. Think we should do more in all continents. We can give match practice and keep sharp those struggling to get onto the first eleven and also those not in the match day squad. Kenny gets a run out, as does Dowell, as does Calvert-Lewin and Lookman and Baines and Mina and, of course, Tosun and Holgate. If needed for more match time after injuries, Gomes and Bernard. I have a sneaking feeling that Sigurdsson gets some time. And perhaps a bench of ten subs, just in case … and for show … and for togetherness …. Beni and Jags and McCarthy may also be nice depending on injury recovery …. I'm looking forward to it …. Two players I don't want to see anywhere near the team sheet: Richarlison and Schneiderlin — for very obvious but different reasons. Start Dowell at Number 10. The club and SportPesa even picked up a pan-African award from a continental marketing body for the success of that event. I appreciate many on here remain sceptical and a few posters would rather the Blues did not play the game tonight. Fair enough. Meanwhile, in my corner of East Africa, 7 blue shirts are chatting over beers and a curry, video calling a couple of mates who made the game tonight. The lucky buggers. I for one am glad and grateful that the blues have decided East Africa is a market they want to cultivate. As a matter of local pride, I hope it ends up being a very successful venture for the club. Let's hope SportPesa make the type of financial contribution that will see our historically weak commercial revenues grow even more rapidly. I think events like tonight will help. Jay @39, hopefully following up alleged interest in Hirving Lozano, I think he would be a great addition to our much-improved squad, whether he would settle in quickly to life in the Premier League is always one to ponder. Dave your Tanzania Everton lack of visibility experience sounds remarkably like a trip up to the West End in London where street stalls are dominated by shirts scarfs etc of the self same teams you describe. I don't think tonight will directly lead to a massive recruitment of fans but is a small step on the way of raising Everton's profile. I agree that what will really do that will be us breaking into the elite. In the meantime, the game is a welcome refreshment, an added extra, a chance to see Everton players in action at a reduced price and to enjoy the sights and sounds around the fat wagon and the green pitch under the floodlights. Away from the Premier League merry go round, it's a game with no pressure and a chance to welcome and appreciate players from a different league where football is played in a different context. An enjoyable break, maybe even fun. I think it has come at the right time, give the likes of Mina and McCarthy and Beningame a run out to get their fitness levels up. Then you have Baines, Jagielka, Kenny, Niasse, Lookman, Virginia and the likes to step up. You just never know when an injury or suspension might crop up, so better keeping those players up to speed in case needed. Nice to see three young lads in with a chance off the bench: Broadhead, Gordon and John. Jay @49, according to the OS, it's 19:00! I thought it was earlier than usual but couldnt find it in the usual areas. Will it last the whole game ?!?! Indeed it is good to see those very young players like Gordon and John on the sheet (and hopefully due a run-out) but I was hoping a bit more for Feeney who I assume is needed tonight for the U21s. Also hoping for another good effort from McCarthy at some stage of the game, on his road back from horrendous injury. Seems that teamsheet is wrong. Beni Baningime playing instead of Leighton Baines. Everton: Stekelenburg, Holgate, Baningime, Jagielka (c), Mina, Davies, Schneiderlin, Lookman, Dowell, Calvert-Lewin. Tosun. Subs: Virginia, Baines, McCarthy, Niasse, Broadhead, Gordon and John. One up after 15 minutes. Could be our first trophy this season! Good run out for Mina, Mccarthy and Baningime. Wonder why no Leighton Baines, anyone got any idea? Good run out for the players who needed game time. On a side note, just seen Sandro on Twitter playing for Real Sociedad against Seville and missing from a few yards out by missing the ball completely and kicking the ground... the ball dribbles to the goalkeeper...and the commentator laughs. The lad is shot of confidence. I thought Sandro, should have stayed with Everton this season, Liam, and seen how things worked out trying to play for Silva? He was quick enough to sign for massive wages only 12 months before, so he should have given us, and himself, more of a chance, rather than just throwing the towel in. A decent crowd turned out for this game with many happy smiling faces from Africa supporting the Gor Mahia team. Plenty of decent football from both teams with nobody going mad but playing at a steady pace. Early goals fromLookman and Dowell put Everton 2-0 ahead at half-time. Plenty of substitutions in the second half with two late goals coming from Broadhead and Niasse giving a 4-0 win, a good workout and a trophy to finish a nice enjoyable night. Now for Chelsea on Saturday!!!! Broadhead looks a useful player. I've seen his name come up a few times in the U23 side. Wasn't the lad who went to West Ham on a free also called Broadhead or something similar? Fairly relaxed kind of win and would have been quite pleasant to watch if it hadn't been for the marketing cretin who handed out free vuvuzelas to every kid. However, it was pleasant to sit on the bus thinking of what I would like to do with three things – a vuvuzela, a lump hammer, and the backside of the said idiot. Ouch, Ron - but agree. I agree that Broadhead looked very impressive on the ball. One to nurture. Delighted to see McCarthy back & looking fit. A few games under his belt and he will be challenging for first team football no doubt. Does anyone know what the attendance was? Thought we put on a good show considering it was pointless. Good runout, rather easy, for Mina. Baningime did well in an unusual position for him, maybe could become a bit of a 'Phil Neville' type, decent but not spectacular in a number of positions. Lookman was brilliant, went on the pitch to stake a claim for a first-team place and he certainly improved his hand. Great attitude, great movement, great finish for his goal. He is a real talent. Walcott and Bernard have real competition here. Great to see McCarthy, as fully fit and inform McCarthy is a real asset to the squad. Davies did well, more so when moved further up. Calvert-Lewin was decent. Broadhead looked a talent. Dowell looked a little too eager, hugged the ball when he should have passed, but took his goal well. Tosun was poor. He does not fit our style and I expect him to leave in January or in the summer. Niasse scored a great goal, but his touch and technique in general is just woeful. Gone in January. Schneiderlin was completely AWOL, I only remembered he was in the team when he took the free kick on 90 minutes. Back to France in January, I expect. Good to see Jags, his final season with us; he'll be 4th or 5th choice. He'd do a job for Cardiff or Fulham, should give him a send-off and then let him go. The two late goals were perhaps harsh on the Kenyans but the final scoreline was a realistic reflection of our team's superiority. At best, the visitors were of League Two standard. What did we learn from this game? Not a lot. It was good to see McCarthy back in the fold. Fully fit, he will strengthen our cover in midfield. Lookman confirmed his rich promise with a lively display. There was nothing wrong with his attitude tonight. Yerry Mina loped his way through the game, in the main keeping things simple. It was slightly worrying he showed some signs of fatigue when sprinting back in the closing minutes. Hopefully he will be ready for the much sterner test which awaits him on Sunday at Stamford Bridge. The young substitutes, Gordon and John, formed a lively partnership on the right. A feature of Silva's early months has been his demand for the wide players to work closely together. He spent several minutes briefing the young duo on what was required before they were thrown into the action. Agree with many that the 'Friendly' was badly timed, and fairly meaningless in as far as results were concerned, but a welcome piece of Silverware to adorn an empty cabinet. It has also been mooted that the standard of Gor Mahia was probably between League 1 and 2. I was a bit disappointed that some of the fringe players went through the motions with little commitment. I would have thought it was the ideal platform for these players to give Marco food for thought... but no, apart from Lookman, Davies (to a degree), Baningime (who was out of position), Calvert-Lewin ( lots of running but no end product), Dowell (a player I like, but tends to fade in a game), the only others worthy of note were the youngsters towards the end. This would also have been a game for Tosun to show what he can do, but I'm afraid he confirmed what most of us thought, that he is simply out of his depth even at this level. His control and first touch is woeful, he expects the ball on a plate, and rarely runs or stretches to receive it. Maybe a bit harsh, but these are highly paid professionals, so in my eyes deserve to be criticised if not producing, or not trying to the best of their abilities. Putting to one side the fact that this game wasn't really significant, if we'd lost or been 'all over the place' against a lower level team like Gor Mahia, folks would have been raising issues about it. It was an easy win, arguably useful for giving players a run-out, and there were no major issues with the way we played. I think a win like this, even against easy opposition, is useful for keeping up momentum in terms of developing a winning mentality. We get more and more used to winning, and it increasingly becomes the norm, which is what we want. We go out to win, regardless of who the opposition are. So far with Silva, I'm happy. We seem to be developing that winning mentality, and we're playing some great football, very entertaining to watch. Makes a big change from the last few years. Through-balls from midfield that would have set an attacker free missed their target or came up short over and over again. This against low-level opposition doesn't bode well for squad depth. Although I am not surprised at the gulf in class, I expected Gor to do better. That they did not was, I think, due to very good performances from Lookman in particular – he really wanted to make his mark, and frightened Gor's right side. I had split loyalties and, while being disappointed for Gor, I had to take my hat off to Lookman, and the professional performance put in by the rest. Tosun might have done a bit more, but he was sharp in the opening 25 and created Lookman's goal. Schneiderlin was, I thought, quiet. But I guess Gor's midfield was rather pedestrian. Decent performance from the blues. Lookman certainly has his fans amongst the locals here. On to the real stuff now! We touched on Lookman's attitude a few weeks ago; whether that was a factor of not being selected, none of us know whether he has been still sulking over not getting his move or if he has been the model professional. A few months ago, he seemed to have a look of "not arsed" from his first appearance from the bench. However, after the game last night, he came out with all the right words and positives about ready to take his chance when called on, and also mentioning Everton going to Chelsea on Sunday with belief. If this is the case and he knuckles down and wins his place, he has a great future at Everton Football Club.